These books are part of the Everyday Earth Science series published by The Child's World in 2016. They look at why the sky displays the colors it does. 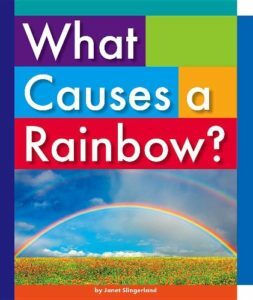 Each book includes a science experiment that lets readers further explore the topics. I bet that after reading these books, you won't look at the sky the same way again. NASA Space Place is a great place to explore Earth and Space including why the sky is blue. NASA, JPL, and CalTech collaborated on a great website related to the Spitzer Space Telescope. 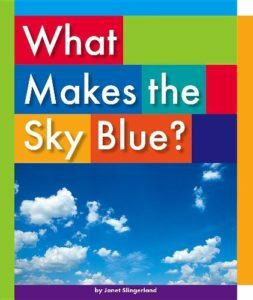 It includes a video series where astronomers answer questions like, "Why is the sky blue?" The University of Boulder created a whole bunch of really cool interactive simulations, including this one where you can explore how our eyes see color. The Science Learning Hub website comes from the University of Waikato, New Zealand. It is chock full of interesting info and activities. This page looks at how we see color. It includes some awesome links at the bottom including a look at how dogs see color. If you want to find out more about clouds, check out this page on JetStream from the National Weather Service.